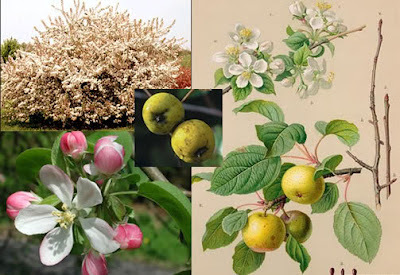 "...support our urban orchard by connecting tree owners with volunteer harvesters and community agencies who can make good use of the bounty. We will be selling fruit and nut trees for planting this fall to keep on doing our good work." I was surprised to find such a variety of recipes that make use of crabapples! Recipes include jellies, jams, syrup, sauce, pie, juice, chutney, marmalade, cider, puree, pickles, fruit leather, apple butter, wine and vinegar. Many crabapples are high in pectin, the substance needed to jell jams and jellies, and so they are often added to other fruit recipes in order to provide a desirable consistency. Seeing as I spent quite a bit of time finding these recipes, here's a list for anyone who loves crabapples, or at least has more than they know what to do with! * Please note that preserving (sealing food in jars and not storing in the refrigerator) must be done with care and following precise instructions in order to avoid the chance of poisoning from botulism. See Health Canada's tips for home canning.